Opportunities for experimentation and for the presentation of art in all disciplines. The McKinney Avenue Contemporary (The MAC) offers opportunities for experimentation and for the presentation of art in all disciplines, and provides a forum for critical dialogue between emerging and established artists and their audiences. The MAC supports the artist's role in society, cultivates that relationship through education and innovative programming, and stands as an advocate for creative freedom. The MAC has been operated by Dallas Artist Research and Exhibition, Inc., a non-profit arts organization, since October 1994. 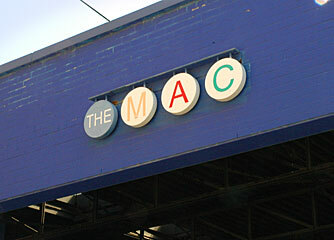 The MAC opened in October of 1994, the first venue in North Texas where contemporary arts in all of its forms is explored and presented under one roof. The MAC is located in an 18,000 square foot building in the former Potts Longhorn Leather Company in the Uptown area of Dallas, Texas. The building was renovated in 1994 by building designers Steve Lawson and Truett James into a handsome and flexible facility comprising a number of intimate and interconnected spaces. These include 2,800 square feet of visual art exhibition space, not including the 900 square foot New Works Space, a 2,400 square foot black box theater, coffee shop, bookstore and CyberCafé. In March of 2000, a 2,500 square foot theater, named the Heldt/Hall Theater, was added to the building. The MAC is a nonprofit 501(c)(3) tax-exempt corporation.